Chris: Paula, do you agree that, here, Abdu’l-Baha takes a definitive position on this question, not only by answering in the affirmative, but emphatically by using the intensifying adverb, “undoubtedly”? … the Manifestations of His Divine glory and the Day Springs of eternal holiness have been sent down from time immemorial, and been commissioned to summon mankind to the one true God. That the names of some of them are forgotten and the records of their lives lost is to be attributed to the disturbances and changes that have overtaken the world. – Baha’u’llah, Gleanings From the Writings of Baha’u’llah, p. 174. After I read this passage from the Baha’i writings and realized we were not singly being pointed out, this lost its emotional hold on me. I then realized I myself did not know the name of the Manifestation or the sacred Message, prior to White Buffalo Calf Woman. I only knew some of the previous Indigenous Manifestations of God and Messages through ceremonies and songs. But yes, in Abdu’l-Baha’s answer the use of the adverb, “undoubtedly” strikes me as a definitive position. And there is huge importance in this, toward bringing about recognition of our Native Messengers of God. This is a much-needed step toward healing the past. The history of religious and spiritual persecution of Native Americans is entrenched in murder, massacre and forced assimilation. Most people don’t realize that, while the rest of the population of the United States enjoyed religious freedom, Native Americans were denied this basic right. It was not until 1978 that we received a partial freedom of religion. This has created a wound far deeper than most can imagine, and denying our Sacred Messengers makes this wound even deeper. Chris: So is it your understanding that Abdu’l-Baha states messengers of God were sent to Native Americans, Native Canadians and Native Mexicans (long before there were any borders separating the United States, Canada and Mexico) and, most likely, to the indigenous peoples of the Americas (including Central and South America) as well? Paula: I find it illogical to think or believe otherwise. 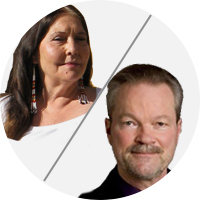 Chris: Here’s my last question: Since the indigenous peoples of the Americas have long believed that the Great Spirit, down through the centuries, has sent wisdom teachers to guide them, then why is this statement by Abdu’l-Baha so significant to you, as a Cherokee, Shawnee, Delaware, Seneca and Lakota Baha’i? God hath raised up Prophets and revealed Books as numerous as the creatures of the world, and will continue to do so to everlasting. – The Bab, Selections From the Writings of the Bab, p. 125. Unto the cities of all nations He hath sent His Messengers. – Baha’u’llah, Gleanings From the Writings of Baha’u’llah, p. 145.
by this I mean it has been a very long time since the land was one mass, and I feel certain the natives got plenty of messengers both before and after that. but we are talking literally tens of thousands of years, not less. The term "Call of God" can have many meanings. For example, Baha'u'llah sent Jamal Effendi to India, twice; to travel through all the provinces and speak of the Faith. This would be one possible understanding of the Call of God in India. “All the Prophets of God have appeared there.” leaves no room for Prophets of God, the capitalization of “Prophets” indicating Manifestations of God, to have other terrestrial origins. Thus, for a Manifestation of God to have appeared on the North American continent, He must have come from Asia. The Master made note of possible crossings from Asia to the Americas. The above indicates that there would have been no Manifestations of God born in the Americas. "It is possible the Indians of the Americas were influenced in the remote past by Prophets in Asia. But again, as there is nothing in our teachings about it we cannot do more than speculate." Section 15, page 31: “… for this did Bahá’u’lláh raise up the call of the Lord”. From these several examples, it is suggested that while the “Call of God” is clearly “founded” upon the teachings of the Manifestation of God, being in the physical presence of the Manifestation is but one means by which people become informed of “His summons”. Okay, so what about Deganawida? Seems he WAS a Messenger of God. What about the lesser Prophets, that upheld many of the major Prophet's teachings? Shoghi Effendi has written that the only Messengers of God from the time of Christ to today have been Muhammad, the Bab and Baha'u'llah. There may have been Messengers of God in the Americas before Christ, as 'Abdu'l-Baha indicates, but I imagine the original names would not be remembered over a period of at least two thousand years. There have been inspired individuals since Christ, like Hiawatha, who lived sometime between the 12th - 15th centuries AD, but he was not a Messenger of God, just as Confucius, Guru Nanak, etc. are not regarded as Messengers of God. Shaykh Ahmad ...and Siyyid Kazim were also not Messengers of God, but were inspired individuals, so it is perfectly possible for inspired individuals to exist without them being Messengers of God. And don't forget the Australian indigenous people, who also had their Messengers. As an anglo female having grown up with a single mother who was Catholic but very open minded regarding religion, that is "as long as you believe in God is the main thing", I was never the less indoctrinated into the patriarchal model of religion...God the Father, Jesus His Son . That we had Mother Mary was in some ways very balancing. In the Baha'i faith we don't have quite this balance as there is little reference to the feminine to accompany us in our daily prayer, or to be present in the majority of Baha'u'llah's tablets. We are required ...to use male pronouns as written and not change them, even if saying a prayer for one's mother! I sometimes wish I had the Native American heritage that you have, with the rich history of female references to messengers and Prophetesses (White Buffalo Calf Woman), Stone Maiden and Flower Maiden, who, if I can imagine, were revered and worshipped as they were and not as some ethereal inspiration for a male deity. Your rich traditions of worship and, dare I say, rituals (rituals are natural to the human experience and enhancing) must, when paired with your Baha'i life, only serve to make your experience all the richer. I had no idea that there was this wealth of spiritual tradition ascribed to White Buffalo Calf Maiden. So this is important! To use a Haudenosaunee (Iroquois) term, are you considered to be a Faith-keeper? Are you at liberty to disclose these Lakota sacred songs? If so, I would honored and privileged to be able to study them. I am also honored and privileged to know you, even though from a distance. I will never forget when you came to Millikin University in Decatur, Illinois (do you recall the date? ), when I was teaching there as an assistant professor of religion, from 1997 to 1999. You made a profound impression on me then, and the several times that I've seen you perform sacred hoop dances since, my admiration has deepened. And so I would be greatly honored and privileged — and I'm sure our readers would be most interested — if you would kindly agree to be interviewed by me for a series of BahaiTeachings articles. If so, would you please email me directly, so that we can get started? P.S. I tried posting this same reply well over an hour ago, but it did not appear, which is why I am posting my reply again in a different place (here). my uncle, the late Charles Wise Spirit from Cannonball,ND, was able to recount the line of Revelators preceding Ptehíŋčala Ska Wiŋ/White Buffalo Calf Maiden. They were first; Tȟuŋkáŋ Wakȟáŋ Wiŋ/Holy Stone Maiden, then Wanáȟča Wašte Wiŋ/Beautiful Flower Maiden. It is interesting to note that Their names progress from the mineral kingdom to the plant kingdom to the animal kingdom. Logically the next would be the kingdom of humankind which, to me, would be the Maid of Heaven who appeared to Baha'u'llah in the Siyyah Chal. Do you think Tunka Wakan Win is why we used to say Tunkasila for Creator instead of Wakan Tanka? I remember being told that Tunkasila was our original word and when the Christian missionaries came they thought we were idolators worshipping a rock and it caused a lot of problems, so the people decided to use Wakan Tanka. Also, I only know one of the really old songs and it's so old that it can't be translated, which might present a possible issue for attempting an academic perspective...? Christopher Buck , hi Christopher, the most authentic repository of information on the Lakota spiritual heritage is found in the text of the 100's if not 1,000's of songs inspired through the dispensation of Ptehíŋčala Ska Wiŋ.... many of the songs are attributed directly to Her! This might make a good research project for some aspiring student of comparative religion? I have analyzed the content of these songs through my own personal lens and have arrived at quite a few personal conclusions. It would be great to gain a more academic perspective! Of course, I respect your idea here. Yet doesn't the idea of the return of White Buffalo Calf Maiden transcend gender? Your late, illustrious mother, Patricia Locke, who was inducted into the U.S. National Women’s Hall of Fame in 2005, believed that Baha'u'llah was the "return" of White Buffalo Calf Woman, didn't she? So there is no doubt that, in this statement, “Bahá” is defined as the mother. The literal translation is that “Bahá” is the female who gave birth to the Maid of Heaven. So it is not deduction. It is the literal word. 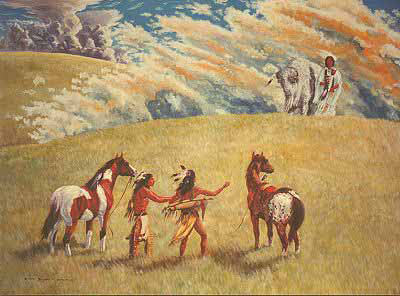 Regarding White Buffalo Calf Maiden's prophetic predecessors, this is new information to me! Thank you for sharing this! Can you tell us more about Tȟuŋkáŋ Wakȟáŋ Wiŋ/Holy Stone Maiden and Wanáȟča Wašte Wiŋ/Beautiful Flower Maiden? Better still, how about writing an article for Bahai Teachings and include it in this series of articles on Native Messengers of God? Many thanks to Dr. Buck and David Langness for their unending encouragement. It is my hope that other Native people will submit articles. We have a voice with bahaiteachings.org.